These unwritten Latino rules cannot be ignored during the holidays. 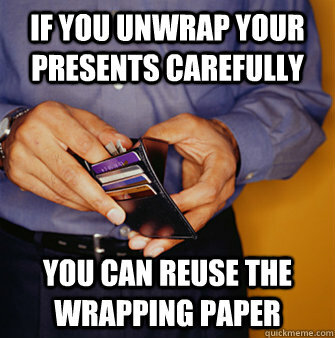 When unwrapping a gift, you are to do it delicately so that the wrapping paper can be used again and again and again. Because all Latinos know that holiday season coincides with “y tu novio” season. So you better come prepared. The diet goes out the window. Watch out for choking hazards. Seriously, you never know when you might bite into a baby Jesus. Really, there’s no point in writing a Christmas wish list because you’re probably getting something that’s been re-gifted. Speaking of… exchanges and returns are out of the question. It’s rude to return or exchange regalos, that’s why you simply regift the ones you don’t like. So much more thoughtful. There’s only one thing on the menu. And guess what? No one is complaining. There’ll be a little friendly gambling going on and credit cards are not accepted. Christmas dinner is a 7-hour commitment. Holidays are also the season of sharing. Don’t forget to click the share button below to share with your social friends. One of the joys of growing up Latino is getting to play with some of these awesome mercado toys that stride that border between fun and freakin’ deadly. Amirte? This could also be called a bonker ’cause lots of kids give themselves coscorrones with them. These were so much fun until you got whacked in the leg with one. That’s a big name for these cute little tortuguitas that are a total choking hazard. The little legs break off easy and the head is hanging by a string. Not to mention how painful it was if you got your finger caught under the turtle’s head. I’m not really sure how a slingshot ended up being sold as a jugete, but m’kay. This might not seem all that dangerous, but it will put you in danger of having nightmares. Creepy much? You made a ruckus and almost plucked an eye out with these things. These balls bruised you up bad, but dang, they were so addictive. You always had that one primo who thought it was funny to shoot at you. These are just plain cruel because the more you freak out about having your finger stuck, the more stuck it is.